Yes, the THOR TOUR has arrived in Dayton! 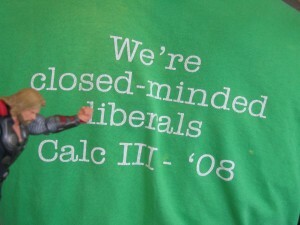 I was a little worried last week when Thor failed to appear in Wapakoneta, about fifty miles or so up I-75 from Dayton. But it was shortly thereafter that we had some really snarled-up traffic on Wright-Patterson Air Force Base. We never found out why (we seldom do), but that night, Thor arrived at my house on schedule, asking about the aliens that are supposedly stashed away there in Hangar 18. “No, you can’t go to the base,” I told him when he asked. “They don’t care if you’re the god of Thunder. No ID, no entry. Besides, there is no Hangar 18. At least that’s my story and I’m sticking to it.” I then offered to take him to the National Museum of the United States Air Force. “What is this ‘United States Air Force? '” Thor asked. “I don’t know…” If he wasn’t interested in metal flying machines for warfare, I doubted he’d be interested in the world’s first practical airplane, with wings of wood and cloth. 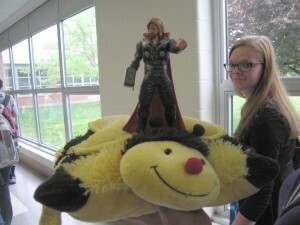 The students escorted Thor around as befitted a Norse god, on the back of a giant bumblebee. Some of the students were rather taken aback at the appearance of a Norse god in class. Thor tried his hand at painting. 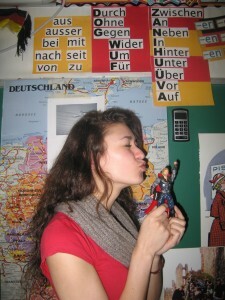 He wasn’t so sure about German, either, but enjoyed the attentions of the ladies. 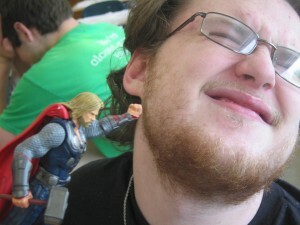 Thor was completely stymied regarding Calculus, so he punched a student in the face. The boy didn’t seem to mind. 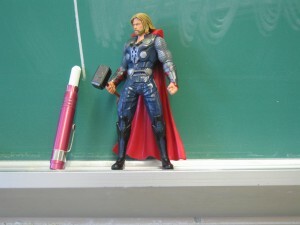 Thor even tried his hand at teaching, and learned that some things–such as commanding the attention of a classroom full of seniors on their last week of school–are beyond the abilities of even a Norse god. Then it was play time. “It’s your last day, or your last year of school, so let’s pretend we’re going back to our first year,” one teacher described what was otherwise known as Kindergarten Day. 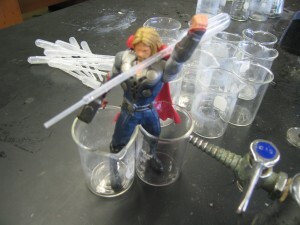 To see where Thor’s been, and where he might show up next, check out the THOR WORLD TOUR page on Debra Kristi’s blog! The giveaway has ended. Thanks for your interest! Quick ROW80 update: Not much to report. I did not get any work done on my revisions, and two out of three workouts done. This week, the plan is to get back into a routine: four workouts, and get through the markup phase of the revisions. This entry was posted in Blog, ROW80 and tagged Dayton, Debra Kristi, High school, Jennette Marie Powell, ROW80, Thor, Thor Tour. Haha! Sounds like a fun and interesting time. A giant bumble bee beast for Thor to conquer and chemicals to play with. Although, I don’t see him having patience to teach kids for even a full day. Just saying. Guess that’s why punched the boy. 😀 That’s so Thor. 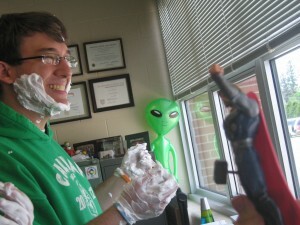 I love that he parted the shaving cream. LOL. Awesome that Thor got to go to high school. Great post, Jennette! 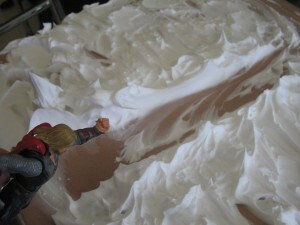 Lynn, I’m not sure which was the more fearsome adventure, high school or the one-year-old boy! Oh, thank goodness you found him!!! So glad Thor showed up in time for his visit with you. It sounds like he had quite an adventure. And for a quick second, I thought he saw Obama too. That boy in the fourth photo kinda looks like him! What great fun! 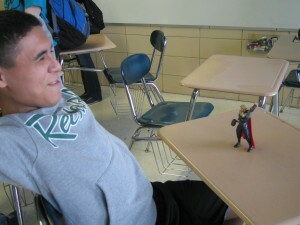 Thor and high school, love it. I’m totally digging the giant bumblebee ride they fashioned for him. What fun. 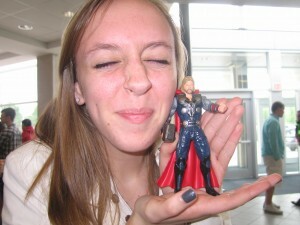 Thor is obviously braver than I am – high school on the last day? Yikes. great post. Sounds like everyone had fun with Thor! What a fun day–Thor is so cute! I’m sure he slept well that night;). So much fun. Love the pictures. You have to have weeks like this, I just know it fueled you. Have a great week, Jennette. Kristi, I wouldn’t be brave enough to go back at any time! Melinda, maybe you should ask him when he gets to you? Coleen – LOL – my daughter tells me that boy is an awesome artist, no political aspirations whatsoever! Tameri – they had fun carting him around school on it! SJ, It was a good week! So relieved that Thor turned up okay. I’ll bet those kids had a blast showing him an All-American high school. Loved this! No wonder you couldn’t get any work done…with that Norse God around. Hope you have a lovely week, Jennette! Best wishes with your goals. 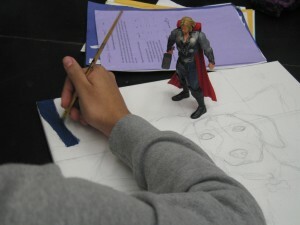 Thor proved his mettle during this high-school rotation. Could a Greek or Roman god have survived a stint with high-school seniors on the last day of school? Methinks not. 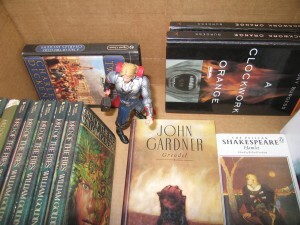 Thor showed what he’s made of during his high school rotation. Would a Greek or Roman god have fared as well with a bunch of seniors on the last day of their last year of high school? I think not. Wait, Jennette! There’s no Hangar 18? Thor arrived on time and got to attend the last week of high school? That was the only week that was any fun! LOL. Loved this, Jennette. 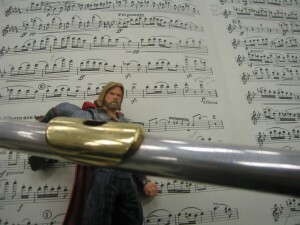 Thor’s world wide tour has been a riot! Thor arrived safe and sound!